The weekend was quite busy, beginning on Friday when I took my niece to Barnes for a scheduled procedure which was reported to involve 3-4 hours of time. After being prepped, we hung out in her "room" for a couple of hours. Part of the time was spent in the dark (literally!) as the power went off in the hospital. It took an inordinate amount of time for the generators to kick on, and even then the computers did not come back up for a bit. We were happy that she wasn't on the table when all this occurred. The test went fine, but the bottom line may be that she will need to have surgery done in the not too distant future. As these things go, it took a lot longer than expected, and I did not get home until 5:30. That night a friend came over and we did some painting together. I had purchased a tea light cake candle last year that I wanted to decorate, and she had a canvas that she was working on. She has a lot of paint colors that I don't have, as well as numerous brushes. It was fun to paint and catch up. Saturday I played catch up with all the things I did not accomplish on Friday, and Sunday I met up with a photographer friend at the Galleria. From there we went to University City to photograph "Mannequins on the Loop." Store mannequins were decorated in recycled materials by local artists and placed along Delmar. They are quite clever, and were fun to see. The Loop is filled with so many interesting buildings, storefronts and bicycle racks that it is easy to quickly pass time taking pictures. Sunday night I squeezed in a game of pickleball. Due to the holiday weekend, it was not at all crowded so I got lots of playing time in. 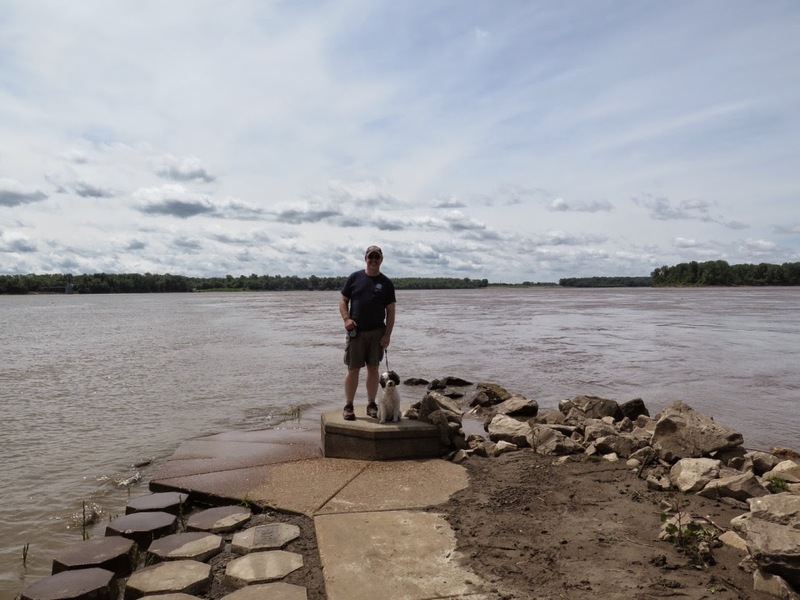 On Monday Jim and I set off with the dog to go to Ted Jones Confluence Point State Park, where the Mississippi and Missouri Rivers meet. Boy, did technology fail us! The car GPS kept taking us down roads that were closed, and not temporarily due to flood waters or anything. 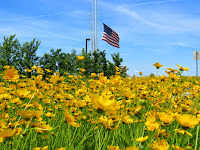 We finally got to the back side of it by taking a day pass road in the Audubon Center at Riverlands. There weren't many people there - gee, I wonder why? 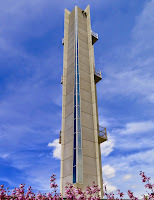 From there we visited the National Great Rivers Research & Education Center across the river, and then stopped at the Confluence Tower. Jim had not been to either of those two places, and I had gone last year because each of them had one of the stl250 birthday cakes. 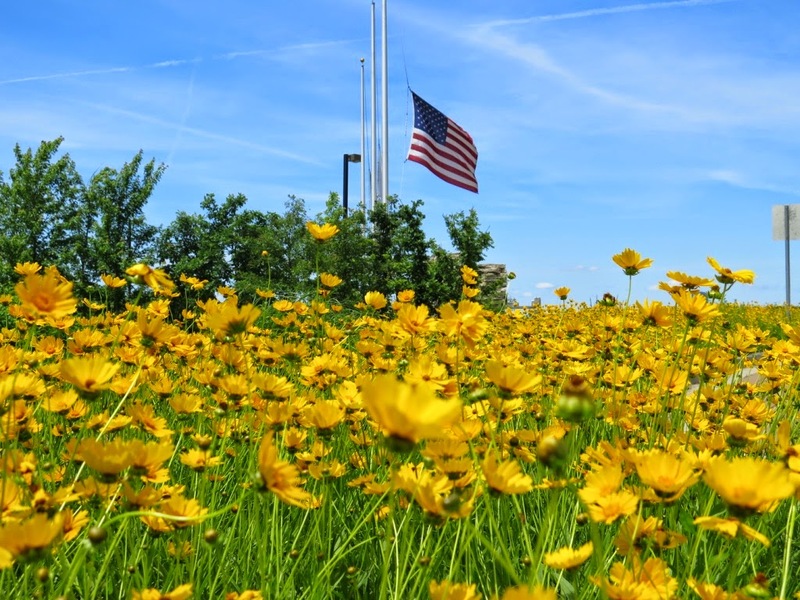 The flags at National Great Rivers Research & Education Center were flying at half mast, reminding us that Memorial Day is about remembering those who gave up their lives so that we can live ours freely. God bless all the fallen soldiers! Last week the annual Family History Conference was held at the convention center in St. Charles, Missouri. I attended my first conference last year in Richmond, Virginia and found it to be a worthwhile investment of my time. This year I was a volunteer as well, since the St. Louis Genealogical Society was the host. On Monday we had an orientation of our duties, and then stuffed around 2,500 canvas bags for the attendees. Tuesday I worked the registration table, and it was fun to see where all the people were from. I even met a couple from Australia! The rest of my volunteer activities for the week involved being a room monitor. That was simply checking to make sure everyone entering a room had a name tag, making sure that the speaker had everything he or she needed, and looking for trash and anything left in the room at the end of the presentation. We were assigned to talks we already planned on attending, so I didn't have to miss anything I wanted to hear. It was a fun job, actually! While I didn't enjoy the drive to and from St. Charles each day, everything else about the conference was exceptional. The facility was perfect and the staff was very responsive, the sessions I attended were informative, and the exhibition hall was filled with good stuff. Best of all, four of the people I went to Germany with, along with our fearless leader, were here as well. I enjoyed hanging out with Sherry and Vickie from Manhattan, Kansas. It was nice to have people to share lunch with as I normally don't know anyone at these conferences. Plus I could have a drink with them at 5:00 when the sessions ended to let the traffic die down before driving home. 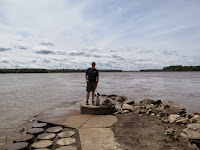 It is hard to believe that it has been nearly two years since we traveled together. We just picked up right where we left off, as if the two years had not gone by. 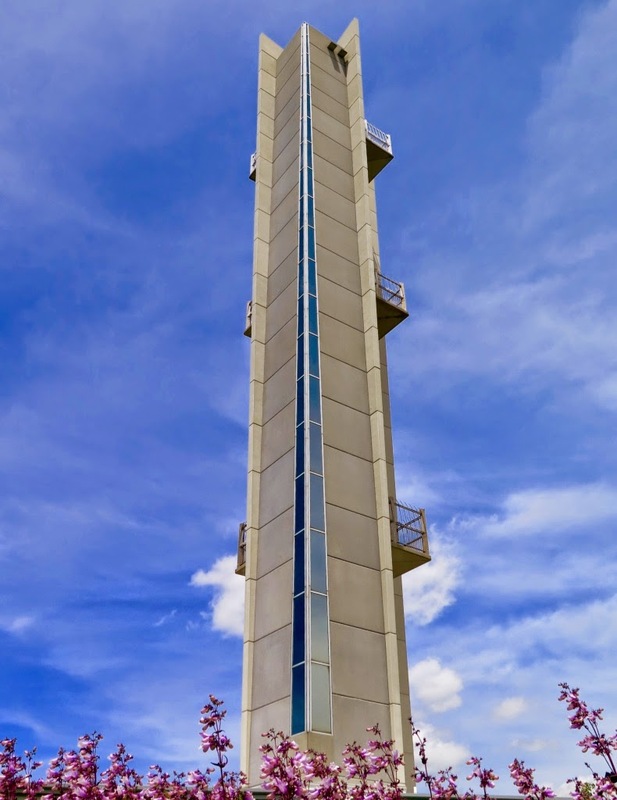 I am hoping to be able to go to the family history library in Independence, Missouri at some point down the road to meet up with them again. Friends don't let friends research alone! The conference was a big success, and the St. Louis Genealogical Society has reason to be proud. It was a wonderful opportunity to show off the assets of the society, as well as our whole community. When I was in high school I read the book On Death and Dying, written by Elisabeth Kubler-Ross in 1969. I may still have my copy packed away with my old books. I used to fantasize that we were related to her since my maiden name is Kubler. But my dad said our family was from Germany and she was from Switzerland, so it was unlikely. (I have since learned that our family came from Busserach, Switzerland so I continue my quest to see if we share some branches on the family tree.) 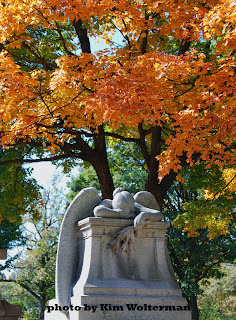 At any rate, I found Kubler-Ross' theory about the five stages of grief to be fascinating. I later wrote some papers about death and dying in college as I worked on my Family Services degree. Someone close to me died last week. Her spouse is not telling too many people, and does not want any discussions about the death despite the fact that it was unexpected. The body was cremated and there will be no funeral. While I respect the wishes of the spouse, I think this approach is very hard on those left behind. Many of us communicate through social media avenues, letting our family and friends know of milestones, successes and yes, deaths. And funerals are for the living, not for the deceased. They are a way to share our memories of a loved one, and to share our grief as well. There will be no closure for the remaining family and friends in this case. I feel bad for all of those who knew and loved this woman who will not be made aware of her passing.